Disability Income insurance protects you in the case of loss of income. If you lose your ability to work, either from temporary or permanent disability, a disability claim can be made. There are many different elements that make up a disability income insurance policy so it is important to understand when and how you will receive the disability income if the need arises. For example, you will need to know how your policy defines and covers short and long-term disability and total disabilities. In addition, it is important to know if there is a waiting period for the income to kick-in and how or if the income from the disability income insurance policy will affect Social Security, workmen's compensation or unemployment benefits. There are also different types of policies to consider such as choosing a short or long-term policy period. Another key element to look for when choosing a policy is knowing if it covers disabilities from both accidents and illnesses. Are you thinking that social security would cover you? Think again. The benefits are limited. To determine your Social Security disability benefits and learn more about benefit eligibility visit www.ssa.gov/disability. Workers Compensation only kicks in if you are hurt on the job. What happens if you are hurt at home? 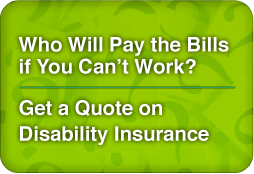 Think disability income insurance. What if you tore a ligament, while playing on that weekend co-ed baseball team, and had to have surgery. You'd be out of commission for awhile. Disability income insurance can also replace lost income on a temporary basis, while you heal from the hazards of being a "weekend warrior". Your greatest asset is your ability to earn a living. Think about it—what would become of you and your family if you suddenly became disabled and were no longer able to work? Disability income insurance can play a crucial role in helping you manage your financial needs if a disabling illness or injury occurs.